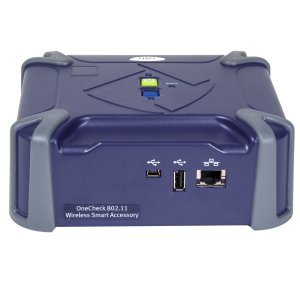 The first WiFi/wireless LAN analyzer built for installers at all skill levels with intuitive capabilities for rapid characterization, optimization, and troubleshooting of home WiFi networks. Increasingly, end users depend on WiFi to reliably deliver premium services such as video and IPTV to endpoints throughout their homes. However, the highly dynamic nature of WiFi networks (including spurious interferers, in-channel or channel-overlapping networks added by other parties, and growing numbers of WiFi devices) has a continuous impact on performance and QoE. As a result, 40% of all trouble calls are now WiFi related. Technicians who install and maintain WiFi in the home require robust installation methods and rapid troubleshooting capabilities. The WiFi Advisor consists of an iPad app and one or more WFED-300AC test devices. It is the first test solution to meet the specific needs of installation professionals at all skill levels. Providing a new, visually rich approach to testing, its intuitive capabilities enable rapid characterization, optimization, and troubleshooting of highly changeable and vulnerable home WiFi networks. It shows a whole-home view of real WiFi performance/throughput margin and can deliver easy-to-understand performance information directly to the end customer.